We are the manufacturer, trader and supplier of Designer Earrings such as Small Fashion Earrings, Small Rhinestone Earrings, Small Pendant Earring and Designer Finger Ring. These earrings are carefully designed utilizing excellent quality raw material and advanced technology. 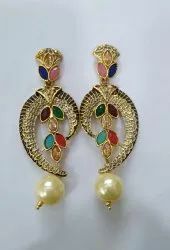 Our offered earrings are extremely acknowledged by clients and demanded in the global market for its specific features like design, glow, durability and skin-friendly. The entire range is rigorously tested on assorted parameters of quality.